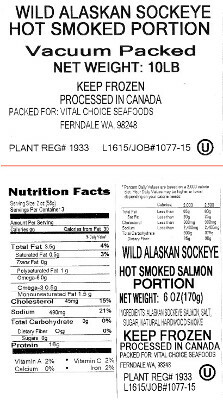 US Wellness Meats is pleased to partner with Vital Choice Wild Seafood to bring you Wild Alaskan Sockeye Hot Smoked Salmon. Our savory Wild Alaskan Smoked Sockeye is cured in a light salt brine and slowly smoked over pure, natural alder wood. Immediately flash-frozen to lock-in freshness ... just thaw and serve! It's delicious warmed too! NOTE: While there is Raw Demerara Sugar used in the brine, it's not enough to measure on the nutritional panel.